When Tasmanian Architect Stuart Tanner and his clients had compatible design ideas about how a home should interact with its environment, they together formed the beginnings to a grand end result. 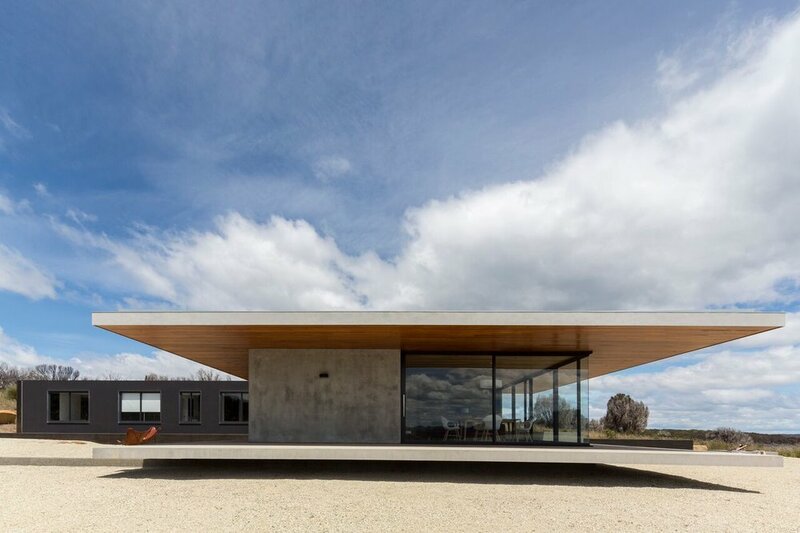 The Younger House in Dunalley, Tasmania is a striking home paying true testament to that fusion of like-minded thinking. Surrounded by a dramatic landscape it was important there was minimal distinction between inside and out creating a seamless harmony. When the original Dunalley holiday home was demolished due to bush fire on the site in 2013, it was essential construction methods for the new build met with strict fire requirements. Perched in amongst rugged coastline and bush surround, and exposed to all the elements, building a home made predominantly from concrete was going to work effortlessly with the landscape, as well as tackle the brief precisely. Large expanses of glass were high on the wish list to truly maximise the unity between home and landscape. “The architecture is set low in response to the scale of surrounding landscape. Ultimately any remote Tasmanian building is engulfed by the supremacy of its context”, states Tanner. The sleeping wing sits into the land at the rear affording it a quiet and protected feel. The living ‘social pavilion’ sits slightly raised at front appearing as if almost hovering. The large 12mm toughened window expanse protecting from the north-westerly is compensated by the building’s high thermal mass, solar gain and internal insulation.